Its model number and name are #013-015 / Hourman. 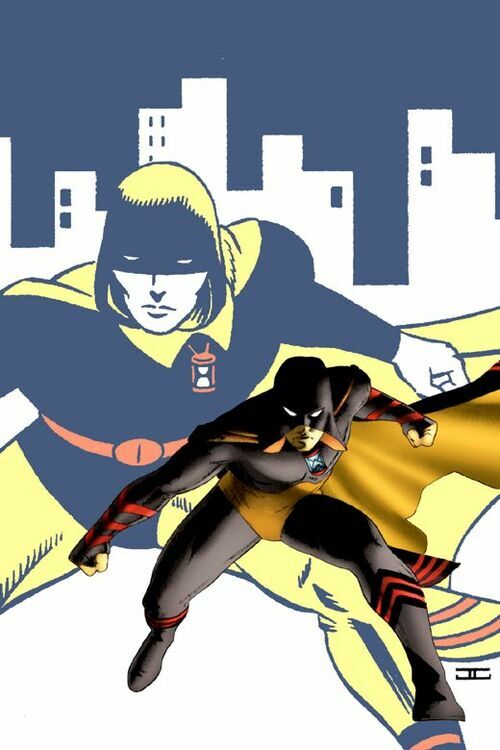 Character Bio - Son of the original Hourman Rex Tyler, Rick followed in his fathers footsteps and became the second Hourman, using the drug Miraclo to give himself super strength, invulnerability, and super speed for an hour at a time. Rick quite the superhero business when he contracted cancer due to prolonged exposure to Miraclo, but later restarted his career after the time-traveling android Mathew Tyler (the third Hourman) cured him and gifted Rick with a new, safer way to use Miraclo. Later, Rick fell in love with and married a fellow member of the Justice Society of America, Jesse Chambers. As a Metahuman, Hourman has these Metahuman Synergies. As a Protégé, Hourman has these Protégé Synergies. As a Rick Tyler with the Bonds of Marriage special power, Hourman may be activated by Liberty Belle with her Bonds of Marriage special power. Hourman may use his Bonds of Marriage special power to activate Liberty Belle. 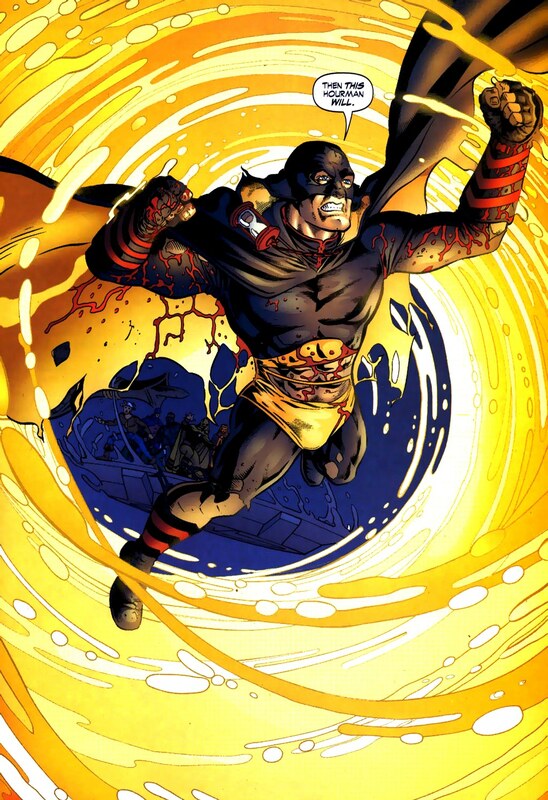 As a figure that can gain the Super Strength special power, Hourman may not be affected by aspects of certain special powers. Current Special Powers that Interact Differently with the Super Strength special power. 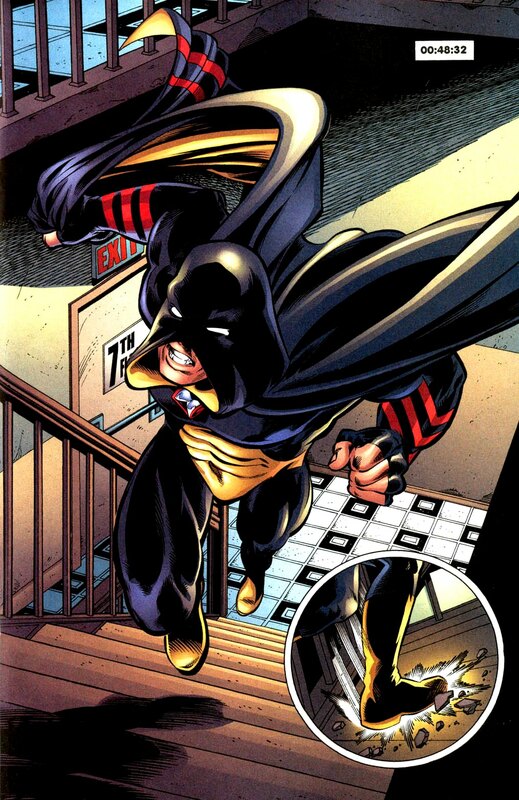 As a figure that can gain the Super Strength special power, Hourman may interact differently with certain special powers. Current Special Powers that Interact Differently with the Super Strength special power. Last edited by Ronin; November 3rd, 2017 at 11:29 PM. Once per game, at the start of a round before Order Markers are placed, you may place 3 yellow Miraclo Markers on this card. Before rolling for initiative each round, if there is at least one Miraclo Marker on this card, you must either reveal an "X" Order Marker on this card or remove a Miraclo Marker. If you remove a Miraclo Marker, for the duration of this round, Hourman gains the Super Strength special power and adds 2 to his Move, Attack, and Defense numbers. Immediately after rolling for initiative, if there is at least one unrevealed Order Marker on this card, you may roll the 20-sided die. If you roll 11 or higher, you may choose an opponent and view all unrevealed Order Markers on cards the chosen opponent controls. After revealing an Order Marker on this card and taking a turn with Hourman, you may immediately take a turn with a Jesse Chambers figure you control that has this special power, and you may not take any additional turns with other figures you control. During this turn, that Jesse Chambers figure can attack only while adjacent to Hourman. Immediately after rolling for initiative, if there is at least one unrevealed Order Marker on this card, you may roll the 20-sided die. If you roll 8 or higher, you may choose an opponent and view all unrevealed Order Markers on cards the chosen opponent controls. Once per game, before rolling for initiative, you may reveal an “X” Order Marker on this card to activate Miraclo Injection for the duration of this round. While Miraclo Injection is active, Hourman gains the Super Strength special power and adds 2 to his Move, Attack, and Defense numbers. After revealing an Order Marker on this card and taking a turn with Hourman, if you control a Jessica Chambers figure adjacent to Hourman, you may immediately attack with that Jessica Chamber’s normal attack. Alright, so this is the same write-up I posted in the JSA faction thread, with a couple small changes: his class was switched from Prodigy to Protege, as Protege seemed to have a little more support and it's my preference (we'll need to make a final decision on this though); I changed Limited Precognition to Tachyon-Enhanced Hourglass, and then opened it up so you see all the OMs from a single opponent (as opposed to Limited Precognition just looking at one card); and Miraclo Pill was switched to Miraclo Injection, which is a little more accurate for the period of his character I'm trying to capture, and leaves the power name "Miraclo Pill" open to be used for Rex (I also slightly changed the activation points for Miraclo and Hourglass to clarify how they interact). 1) I'm not sold on the power name "Married Duo" (previously “Husband and Wife”), anyone have any better suggestions? 2) As I mentioned, we'll need to make a final decision on a class to use for the younger JSAers. My preference is Protege, but some of the other ones discussed were Prodigy, Rookie, and Amateur. Crime Fighter had also been discussed, but I'm personally strongly opposed to that direction. 3) Is Tachyon-Enhanced Hourglass too strong? I timed it so it wouldn’t work with Ozy, but it could still be pretty strong with Mad Thinker. 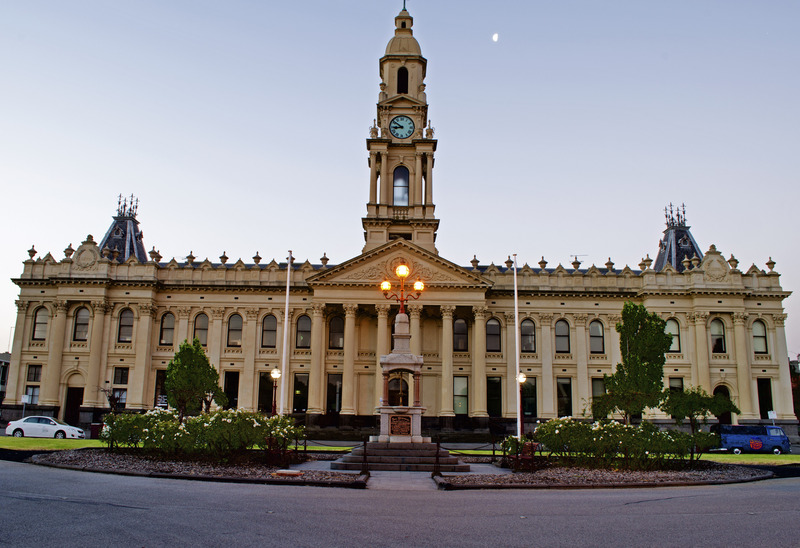 I'm thinking a clock theme here, so I aimed for any urban setting with a clock visible. Yeah, the "Married Duo" is the only thing I'm not liking here as well. Is: "'Til Death Do Us Part" too long? Even "Love and Marriage" might be better. Marriage Vows? Marriage Bonds? I like "'Til Death Do Us Part"
I'd go with "Marriage Vows" - lots of stuff in there, loving and cherishing, sickness and health, and the sort of general sort of "obligation to help the other person out" implication that fits the mechanic. What's the theme on the Hourglass? Ooh, good suggestions, I really like Marriage Vows and Marriage Bonds. Mathew Tyler (the Android Hourman) gave him a Tachyon-Enhanced Hourglass that allows him to see an hour into the future. I'm a little bit worried about Hourglass+Joker or Mad Thinker, but relying on the D20 should help mitigate things. Otherwise, I like the design. Eh, Marriage Vows seems kinda bland to me, but it's not horrid. Joker + Hourman + Robot (although honestly Robot + Mad Thinker is some nice synergy too) could be annoying but I doubt it'll be super problematic. I could see someone with the Reality Gem being more annoying.